As I sat down this morning in Tundra Buggy Lodge over a bowl of oatmeal, I looked out the window and saw a polar bear casually strolling toward the window. She looked at me and I looked at her and the moment our eyes met, I felt as though she was pleading with me to help her. If polar bears could talk, what would they say? 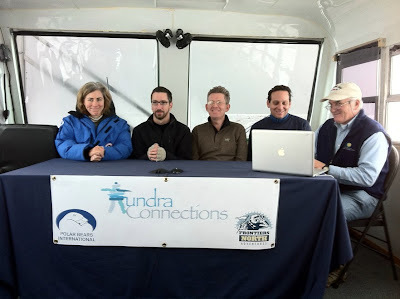 Today's Tundra Connections webcast was focused on "Nanuq: The Great White Bear" and it was great. The many questions that were submitted by teachers and students made for a rich conversation and it was very comforting for me, as the facilitator, to see several familiar names and faces (okay, profile pics...) dropping questions within the Edmodo PBI Community. I got to sit back and watch the two afternoon webcasts - one with University of Chapel Hill and a webcast on marine biology that attracted over 100 participants and covered some critical issues related to global climate change. There sure is a lot less pressure when you're off camera for these conversations! With all the activity aboard Buggy One today, we sure didn't have much time for bear watching, so I'll share a few more pics from yesterday. So, if polar bears could talk, what would they say? Think about it. But we all know that polar bears can't talk, so we need to speak and act on their behalf. What will you do or say to help the polar bears? These photos are AMAZING Andy! I would love to print a few to frame in my classroom. Let me know if you are willing! My students are gong now but we are going to read "Winston of Churchill" and your blog posts in the morning, and reply to your post here about what polar bears would say if they could talk. That's fantastic, Leslie - thanks for following along! If you're printing & displaying my images, that would make me very happy! We are really enjoying these photos, Andy! Hello I name is Jada and i am in Mrs.Dent Scrcellos class. we have been on your blog all most all day and know polar bears are my new favourite know i think they are so cool and cute. Andy if polar bears could talk i think they would say " hey all ways recycle and and we LOVE trees"
If polar bears could talk they would say please stop polluting around the world and stop wasting paper Matt. I have a few ideas on what if polar bears could talk. One idea is "What an intreating snowhill(buggy 1). and another is "Are you the one who's breaking our habitat?". My question is how long did you stay in the tundra? If polar bears could talk they would say "stop globel warming and recyle reuse and ice is nice"
or "stop the trash and save more trees" and another one is "keep the ice then we can eat". what are polar bears like in person are they scared of you? Hello, your pictures are really cool! And cute. I think polar bears are really cute. I would love to go on one of those and see one in real life. I think that if polar bears could talk they would say this." I am starving here. It's all because, people are pulluting the air by using so much energy". I also have a question for you. Is this your full career? How are you liking it? Is it fun? So if polar bears could talk i think theyed ask for help because of global warming. Also theyed ask to stop driving and start walking to school more. Because driving is pullutineing the world. I think if a polar bear could talk it would want the ice to freeze so that they could hunt seal and fish.And it would want it to never let its cubs go hungry.my question is your favorite animal a polar bear? STOP USING TONS OF PAPER AND HELP US!!!! !because people are using WAAAY too many papaer. It's getting kind of dangerous for us too. has a polar bear ever woke you up in the morning by banging the tundra buggy? ice is nice we love trees ride more bikes save more power save more Bear`s!! I think they would say these things because well they dont want to go instinked. I think they would say ice is nice. Please recycle to save the climent. Quite smokeing it causes climent change. Why the bears would say these things because they like the cold weather and like the ice so if you do all that stuff it could cause globle worming. Please save me and my family by turning the t.v off and lights off when your not in the room. STOP CUTTING THOSE TREES! YOUR KILLING ME! HEY, STOP! (Baby) Mommy, look at the car! (Mom) Son that is a buggy... AHHH!!RUN!! Ride your bike or walk! If you were a polar bear, what would you say? If polar bears could talk they would say why cant you get that seal mama. Because the ice did not freeze yet cub.They would also say when will the ice melt so we have water. So if polar bears talk their probably going to ask for help to stop wasting papers, saving enery,watch tv less and turning lights off. Also stop the greenhouse poluttion because cubs are trying to survive. Ice is nice, Save the trees, Hey Bob ever heard of recycleing? recycle!, save power and a bear, Please take short showers. If polar bears could talk i think they would say where are all those seals. Ithink they would say that because the ice would be breaking. Or git off my propirty to another animal. They would say that because the animal would be on it's propirty. We need ice befor it is to late.If thery is no ice then we cant hunt seals. And i got a question how do polal bears servive in the heat? If Polar Bears could talk I think they would say "Stop polluting and save our ice" because the heat is rising because of pollution and if the heat is rising the ice is melting and ruining their homes. Thanks for all of your amazing comments, boys and girls!!! 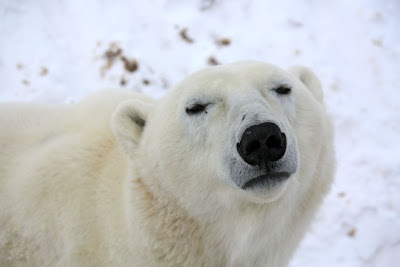 Katie - if I were a polar bear, I would say "Do whatever you can to protect me!" Ice is Nice or Save energy by turning off lights and your TV's. Maybe they might say Use both sides of the paper before taking another one. They would say please save us.They probly think if you gyes have a house than we should to. Is there a way you can tell what age they are or do you guess. If polar bears could talk they would say I need food. And don't pollute beacause it melts the ice. We are looking forward to you coming to visit us on Thursday. We read all the comments above - these are great ways to help the polar bears. We have some questions - Do polar bears eat fish? Can you tell us all about polar bears? How cold was it in Churchill? Can you bring your pictures of polar bears? 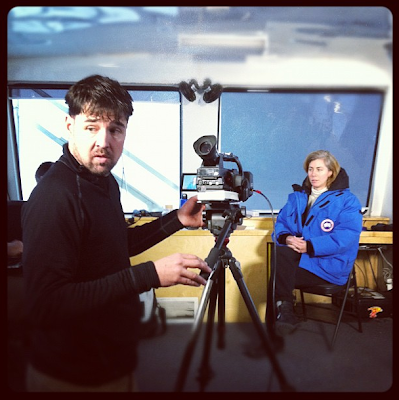 Please tell us a bit about what it was like to be there and to work with them. I'm looking forward to coming to your school to share some stories and pictures with you on Thursday! Yes, polar bears do eat fish. Churchill wasn't as cold as I expected, but it was still colder than Winnipeg has been over the last several days.